Contact has been made! Raquel (the president of the Chilean Baptist Union) gave us the email address for Marcelo, the Chilean Baptist missionary we will be working with once we arrive in Chile. Realizing that our departure date is still a good ways in the future, we hoped that this would be a good way for us to make a first connection and to begin forming a relationship. So two days ago, in the best broken Spanish I could muster, I sent an email to Marcelo. Knowing where he works and from previous experiences with sporadic internet, I wasn’t expecting a response for a few days if not a few weeks. Needless to say, I was extremely surprised when I checked my email yesterday and found not one, but two emails from Marcelo in my inbox; one of which contained some great pictures of the area and his work there. It was great to receive news from him. He mentioned that he and the churches of Chile are praying for us as we prepare. To realize that we are not only being prayed for here in the United States but that there are believers in Chile that are already praying for us was a humbling realization. Thank you for all of your prayers. 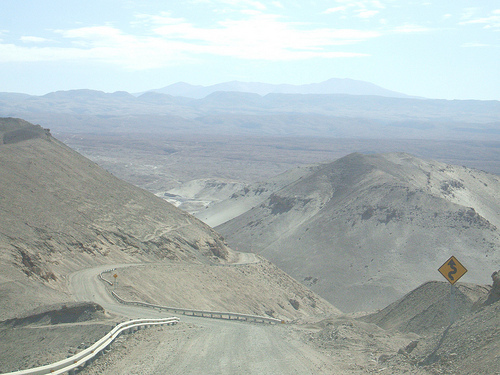 And just in case any of you were wondering what a desert in the Andes mountains looks like, I’m including one of the pictures Marcelo sent us (more are sure to come!!!). This entry was posted in Uncategorized and tagged Chile, Ministry. Bookmark the permalink. Is this Marcelo Rebolledo and his wife Gisiella? We worked with them when they lived in Temuco. They are wonderful people. His dad was (is?) pastor of a large baptist church in Temuco. My wife Becky and I lived in Temuco from 2002-2005 working with the Mapuches and our oldest son was born there. God bless you on your adventure and I pray your funding will come quickly. Your going to a beautiful country full of beautiful people. Thanks for checking out our blog and what we’re up to. It’s actually a different Marcelo. We’ll be working with Marcelo Ramirez. I do think he worked with the Mapuche in the past (coincidence, I guess) but he is now working in the far north with the Aymara. Thanks a lot for the prayers and blessings!! !